Quina Quen is a playable character in Final Fantasy IX. Quina is from a genderless race, and is on a quest to consume new cuisine (and enemies). The character is referred to with male and female pronouns throughout the game, and, according to most descriptions, acts as comic relief in the game. 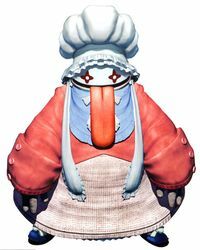 Quina possess a “childlike curiosity” and also speaks in broken English in the translated version and Japanese with a Chinese accent in the original version. At one point in the game, it is possible for Quina to marry a male character named Vivi.